These fun dippers are a little sweet, a little salty and all good. 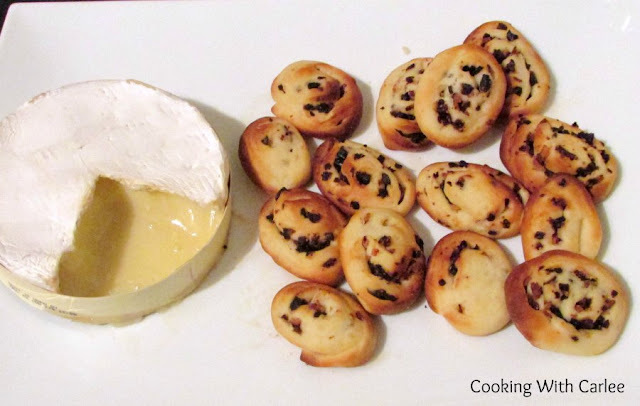 They are wrapped up in crescent dough and perfect for dipping in warm brie or camembert. They are a great fun and different appetizer. It is Foodie Extravaganza day! I am so sad that I didn't participate the last couple of months. The theme for November was pickles. Now, I love pickles. But I had already shared the two recipes my cousin Cori makes this year. Her refrigerator pickles and gone in a second pickles are both amazing! So with no family favorite pickle recipes to share and a pretty full slate of other things to post, I opted out. Then there was the December fruitcake theme. I had all of my ingredients bought and a recipe picked, but didn't have time to get it all baked before the deadline. You didn't miss out on anything though, I baked it a few weeks later and it didn't turn out as I envisioned. It wouldn't have been the kind of thing I would be proud to tell you about anyway. So I was determined to make something for January. I went to check this month's theme and it is croissants. Now, I love a good croissant and really want to make them from scratch someday. But I am sure you know how it is this time of year. Between all of the Christmas activities and work it is hard enough to just keep your head above water and make sure everyone ate at least some sort of balanced meal each day along the way. Then our New Year's Eve menu turned into something epic. So I figured I better make crescents instead. That was much easier to wrap my head around. A family friend shared her grandma's recipe for crescent rolls and we really loved it! It was enough to make 4 dozen crescents. So, I made a dozen and froze three balls of dough for future use. One came out for another batch of crescent rolls the very next day! The second came out for these little gems. My original thought was to put the Camembert in a crescent shell, but I have found when I do that people aren't likely to eat it. I don't think they are quite sure what to do with it. So, I thought if I made them some fun dippers for their melty cheese it would be easier to manage. I was right! These little dippers have just enough sweet and salty taste to really compliment the flavors of soft gooey cheese. Plus they are fun and not at all intimidating! Make sure figs and bacon are finely chopped and well mixed. I rough chopped each, and then combined them and ran my knife through the mixture a few times. Roll the dough into approximately an 18x10" rectangle. Sprinkle bacon/fig mixture over dough and roll like you would cinnamon rolls. Cut into thin slices, somewhere in the 1/4 to 1/2" range would be fine. Place on baking sheets and cover with slightly damp towels to rise for about an hour. Gently brush tops with butter. Bake for 6-8 minutes or until golden brown. Serve with warm cheese for dipping. Love the mix of sweet and salty in these, Carlee! Perfect for dipping in Camembert! Thank you, Stacy! I loved the flavor combination! Oh my goodness, simple yet yes, extravagant indeed!! These sound like heaven!! It was fun to try something a little different! Thanks, Andrea! What a creative and delicious sounding snack. Perfect for a party. It was a great starter for our New Year's Eve get together. I really enjoyed them! I love this idea! Maybe I'll make them for the ladies at the super bowl. The guys seem to be fine with chips and salsa, but the girls, well, we'll get the good stuff! Oh wow, these sound amazing! I love how cute and fun they are and then on top of that, it's bacon and fig and rolls all mixed up pretty and ready for a gooey dip! Crazy flavor town! I bet this appetizer totally stole the show. Can't wait to give it a try! I probably ate more than my fair share of them. But it was for quality control purposes, so it is excused. Right? Thank you so much! These are such a great idea, and sound really tasty as well. I can see me nibbling on them all night! Thank you! It is hard to keep form going back for "just one more!" What a great little finger food...I love appetizers...and cheese and all the salty sweet goodness! Great little recipe Carlee! I am a sucker for this kind of food. I could live on little appetizers (and of course desserts!) Thanks, Elaine! I missed Nov and Dec too. These looks amazing! Thank you! I'm glad we both made it this month! These look so good. I will have to try them out. I know I picked the theme, but I had no idea croissants were so time consuming to make. I don't make anything with yeast because we have issues with each other. I'm glad you were able to join in the party this month. I was too scared to do a whole lot with yeast until fairly recently. Luckily I have had mostly good results. I really do want to do from scratch croissants one of these days... I wish I could have pulled it off for this post! What a great idea and a great appetizer! Thank you so much for sharing with us at Full Plate Thursday and have a great day! It is a lot of fun! It is nice having prompts for posts and it is really interesting to see what everyone else made following the same prompt. We'd be happy to have you if you had an interest to join! Wow, does this ever sound like a fun challenge, so of course I requested to join. By the way, those dippers? Heaven!! Yay! It is so much fun! Thank you! This sounds so good, and would be great at a party. I haven't tried melted Camembert before, but I think I might have to! We really enjoyed it and it was fun to serve! 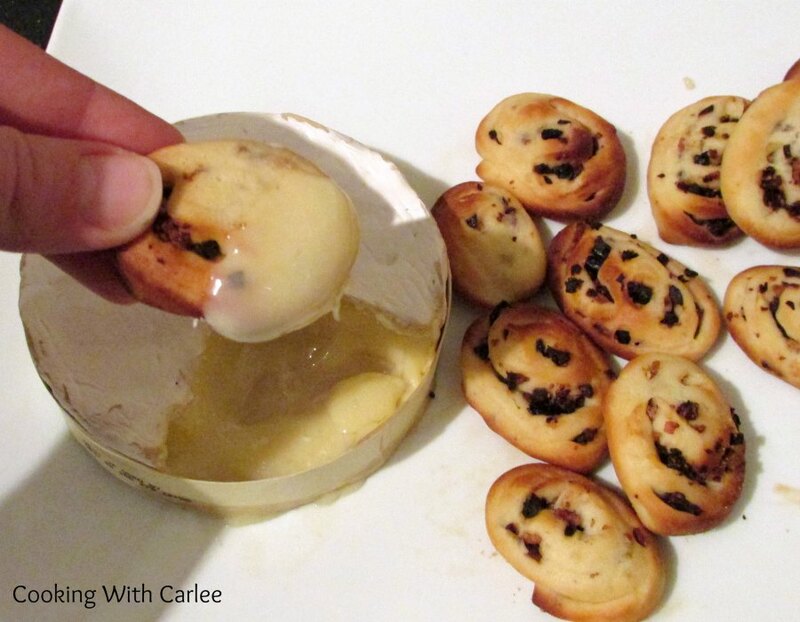 If you like Brie, it is definitely worth a try! How can one pass up a bacon dish? This looks divine:-) Thanks for sharing your recipe with us at Funtastic Friday. Thank you so much, they were fun to make and eat! Thanks for hosting.